3. Have you been in China, Hong Kong, Vietnam, Singapore or Taiwan in the last 10 days? 4. Are you experiencing any of the following symptoms? The content and pass/fail criteria of the questionnaire have been changed several times by the ministry, and the electronic screening tool is constantly being updated to reflect the latest version of the paper screening tool. A fail results in home quarantine for 10 days or seeking of medical attention, or both. The ministry's hospital directives had major implications for all health care facilities, including the mass processing of hospital staff at major shift changes and the movement of staff several times per day between multi-site institutions. We describe the experience in Kingston, Ont., and the use of a Web-based screening tool to facilitate the SARS screening process of hospital staff. Copies were made of the SARS screening questionnaire received from the ministry. Staff were posted at both the patient and employee entrances of the hospitals. At the staff entrance, security personnel checked and verified employee identification, and nurses administered the screening questionnaire. Employees were required to complete the questionnaire each time they entered a health care facility; this included personnel who travelled between sites (the Kingston General Hospital [KGH], the Hotel Dieu Hospital [HDH], the Kingston Regional Cancer Centre [KRCC], St. Mary's of the Lake, and the Providence Continuing Care Centre). The staff entrance at KGH had up to 5 nurses performing screening and an equal number of security personnel verifying identification during peak screening periods (e.g., shift changes). The screening process resulted in long line-ups at the entrance. Every completed questionnaire had to be reviewed and signed by a nurse. The completed questionnaires were stored, unfiled, in cardboard boxes. Retrospective review of the questionnaires was the only means of tracking employees in the event of a SARS exposure. An informal review of the questionnaires revealed many names to be missing or illegible, making tracking impossible. 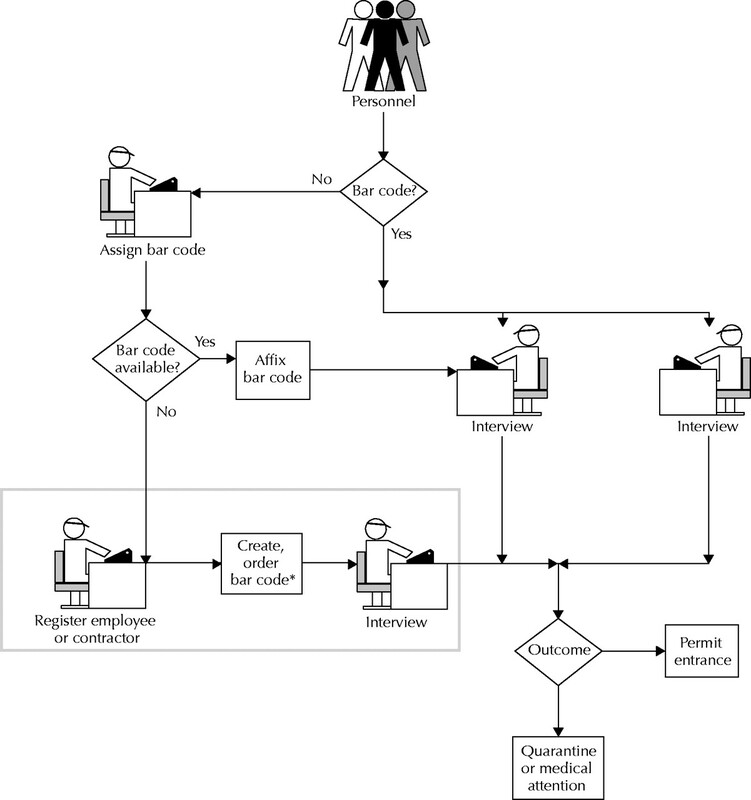 Given the limits of the paper-based screening process, the Queen's University Anesthesiology Informatics Laboratory (QUAIL), at KGH, developed an electronic Web-based SARS screening tool that would have several advantages over the current paper-based process. QUAIL was able to accomplish this task very quickly because of expertise, knowledge and hardware gained from its previous work in the development of handheld software and implementation of a wireless network for the point-of-care capture and retrieval of data for patients in the Acute Pain Management Service. The development of the SARS electronic screening system was accomplished through collaboration and networking within KGH and between KGH, HDH and KRCC. The collaborative effort between administrators, information technology services and other disciplines across the 3 institutions accounted for the speed with which the SARS electronic screening tool was developed. At first, the technology for the SARS system was set up to identify, capture and store onto a server at KGH all SARS screening information for the combined staff of 4176 employees plus affiliated physicians at the points of entry to KGH, HDH and KRCC. St. Mary's of the Lake and the Providence Continuing Care Centre, as well as the St. Vincent de Paul Hospital in Brockville, have since been incorporated into the network, and all data are being stored on the SARS server at KGH. Two additional hospitals in eastern Ontario are planning to join the electronic screening network. The Web-based screening tool was developed for use on laptops or personal computers (PCs) using bar-coding and wireless technology. The wireless infrastructure at KGH provided a convenient alternative to running wires for computer hookups. The other centres involved in the SARS network are not using wireless technology for data transfer and instead are using wired local area network (LAN) technology to send their data to remote Web browsers. The Web-based screening tool was made accessible through a secure, encrypted LAN, which consisted of a PC plugged into the hospital information network or an encrypted secure wireless network. For bar coding, QUAIL used hospital personnel, research and medical school lists to generate unique bar codes for each employee. By 4 pm on Apr. 3, 2003, these bar codes began to be applied to the respective employees' hospital identification badges as they entered the institutions. Fig. 1: Electronic screening process developed to screen hospital personnel in Kingston, Ont., for severe acute respiratory syndrome (SARS). *New bar-code labels are printed by 2:30 pm each day and distributed by the security guard as the employee exits. The employee's record and a new questionnaire are uploaded onto the screening nurse's computer for the purpose of an interview. If pre-existing screening data are available, decision-support algorithms are used to facilitate the screening process. [Figures of 2 examples of responses to the screening questionnaire are available with the online version of the article (www.cmaj.ca).] The employee's oral temperature is taken by the screening nurse if the person answers Yes to any of the questions. The screening nurse is alerted if there is any increase in a previously recorded temperature. If no pre-existing screening data exist for the employee, a status line on the questionnaire indicates this fact. In addition, a question mark appears next to each question, notifying the interviewer that screening data have yet to be entered. To record the employee's response to a particular question, the interviewer clicks on the adjacent question mark once to toggle the response to No and a second time to toggle the response to Yes. Any attempt to submit an incomplete screen results in a warning to the interviewer. Fig. 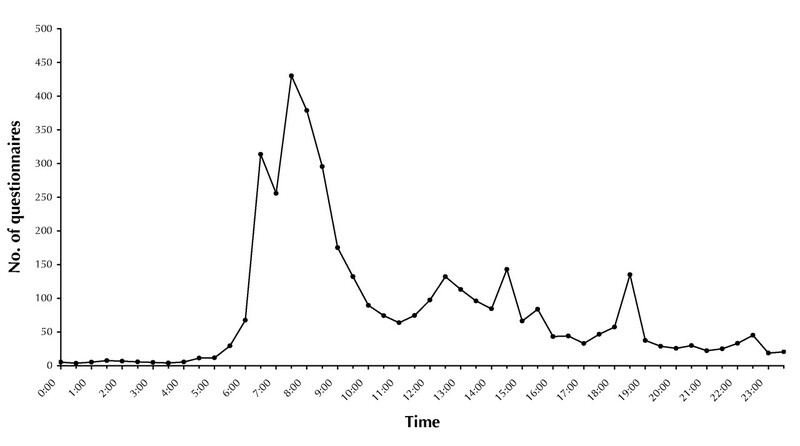 2 shows the mean number of SARS electronic screening questionnaires completed per half hour for the first 10 days of operation. As of Apr. 14, 2003, Kingston had no cases of SARS. During the first 10 days of electronic screening, 5 employees reported having been in contact with individuals with potential SARS and were quarantined; no employee reported having travelled to China, Hong Kong, Vietnam, Singapore or Taiwan in the 10 days before being questioned; and of the 374 employees who reported having symptoms, 2 had a temperature greater than 38°C. In all, 5785 employees, physicians, volunteers and contractors completed 36 628 electronic questionnaires between Apr. 3 (5 pm) and Apr. 14 (9:30 am). Fig. 2: Mean number of SARS electronic screening questionnaires completed per half hour, based on data compiled for the first 10 days of operation (from 5 pm Apr. 3 to 9:30 am Apr. 14, 2003). Given that all hospital employees in Ontario are required to complete the same screening questionnaire, the QUAIL SARS electronic screening tool could be made available to any facility. In addition, the system can be easily adapted to work without bar coding. Given that wireless technology is not available in most hospitals, the application is designed to be equally effective using the hospital's wired LAN. Hospitals would simply have to make PCs available at their points of entry. In addition, use of the SARS electronic screening system province-wide in both health care facilities and public health organizations would greatly facilitate SARS surveillance. Future research efforts are needed to study the use of computer technology to track patient–staff interactions. We encourage hospital administrators interested in exploring the possibility of implementing this technology at their institution to contact us. Contributors: Dr. VanDenKerkhof was the principal author and contributed substantially to the concept and design and to the analysis and interpretation of the data. Dr. Goldstein and Mr. Rimmer contributed substantially to the concept and design and to the data acquisition. All of the authors critically revised the article for intellectual content and approved the final version. Acknowledgements: We acknowledge the dedication of the members of the QUAIL (Queen's University Anesthesiology Informatics Laboratory) team, who spent countless hours at the expense of sleep to pull together the SARS electronic screening tool. We also thank the administration, information technology services, staff, physicians and volunteers of the Kingston General Hospital, the Hotel Dieu Hospital and the Kingston Regional Cancer Centre for their patience and understanding during the implementation of SARS electronic screening process. World Health Organization. Affected areas — severe acute respiratory syndrome (SARS). Geneva: The Organization; 2003 Apr 1. Available: www.who.int/csr/sarsareas/2003_04_01/en (accessed 2003 Apr 15). World Health Organization. Cumulative number of reported cases of severe acute respiratory syndrome (SARS). Geneva: The Organization; 2003 Apr 1. Available: www.who.int/csr/sarscountry/2003_04_01/en (accessed 2003 Apr 15). Ontario Ministry of Health and Long-Term Care. Fact sheet — SARS hospital directives. Toronto: The Ministry; 2003 Apr 2. Ontario Ministry of Health and Long-Term Care. SARS clarification: Hospitals outside GTA should continue elective services. Toronto: The Ministry; 2003 Apr 3. Available: http://ogov.newswire.ca/ontario/GPOE/2003/04/03/c7575.html?lmatch=&lang=_e.html (accessed 2003 Apr 15).